About image of the Day @wisdomsdoor.com, Inner Space: Your reality is a product of your inner world. To discover that inner world takes time and meditation! Meditation is a great tool for exploring your inner self, finding out the gems there, and where your expansion may take you! This picture is kind of like the Hermit's Cave location in the TOL. You fill it with the things that are special to you. It is picture of that inner place where you go when you meditate and you bring with you all those special things in your life. The magic lamp reminds me of the Jennie where you rub the lamp and get your wish (reality creating). Incense, I love incense when I meditate. It can set the tone of the energy around you. I like Clary Sage mixed with Citris or Orange myself. The little fire is just adding some of the fire element to the picture. The tree adds nature, and the pond the water element. The rock is the earth and perhaps the pyramid in the distance stands for spiritual possibility. Inner Space's message is similar to Hermit's Cave, except, this image shows that through meditation the door to that reality is open. The Hermit's Cave is static place of refuge. This picture speaks of the possibility of consciousness and what it can do when properly focused. In this picture, you are not in a cave gathering understanding and rest. 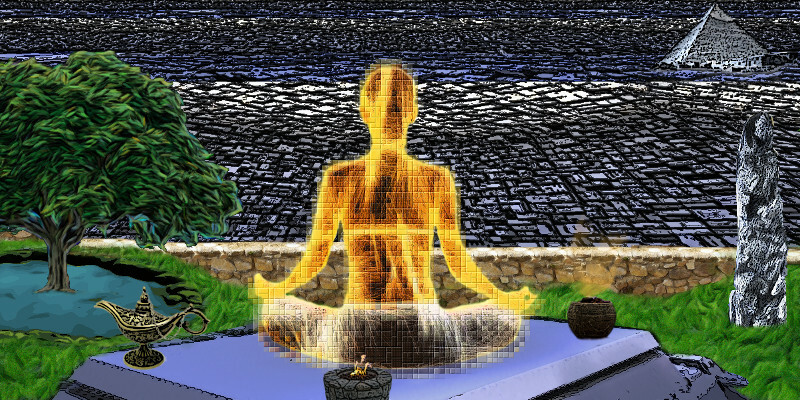 The meditator is full of energy and light. Here the meditator is getting ready to change the world. See the full size image when it comes around for the image of the day! Yep, you will have to check for it every day!